When learning how to cook chicken recipes you will find them to be some of the most delicious and economical meals to make. You can prepare it in such a variety of ways that it doesn’t get boring. When I was young, my dad would spend many Saturdays cleaning the poultry for Sunday dinner. My large family would gather around to eat. Mom’s recipes back then consisted of skillet fried chicken, pot pie, casseroles, or roasted with stuffing. Sometimes Mom would fix her chicken rice recipes. Most of us have learned how to cook chicken recipes that have become our favorites. Poultry is plentiful today; fresh or frozen and in forms to meet every person’s needs. There is also a wide selection of parts for those recipes so that you can purchase only the parts that you will need for your recipe. Almost all countries serve chicken in some form in their cuisine. The various seasonings used from these different parts of the world change the taste of the chicken recipe completely. When you learn how to cook chicken recipes you will find much helpful information on the label or wrapper when choosing the poultry. Processors as well as supermarkets label products to indicate quality. There are many choices in selecting a chicken. Roasters are 3 ½ to 5 pounds. They are tender and delicious when stuffed and baked. Stewing birds are 2 ½ to 5 pounds. They are fatty and less tender, and need to be cooked in large amount of liquid. Fryers are young and tender, ready – to – cook and weigh 1 ½ to 3 ½ pounds. I buy fryers most of the time because they can be fried, baked, roasted, boiled, or anyway you want to cook them. It is more convenient to have them on hand. You should consider your chicken recipes when preparing the bird for storing. Chickens that you plan to use within a day or two can be kept safely in your refrigerator. Other than those they need to be stored in the freezer. Chickens can be kept frozen for 12 month, and cut up ones for six months. It is very important how you handle uncooked poultry when preparing your recipes. It can carry harmful bacteria. Wash your hands before and after handling it. Wash raw chicken in cold water and pat it dry before cooking it. Clean all utensils and cutting surfaces that it has touched with hot soapy water and rinse them thoroughly. It is best to use a cutting board that has a hard surface, otherwise give special attention to the crevices. Replace all towels with fresh clean ones. Always use different platters for the uncooked and cooked chicken. Our recipes cover dishes from most countries. It is a poultry that is used in appetizers, soups, salads, casseroles, and stews and alone. Many times turkey can be substituted without much notice in taste. Because they are so much larger, it is sometimes good to be able to use the extra meat instead of chicken. NOTE: When learning how to make chicken recipes, sometimes we might want to substitute pieces of chicken for the whole chicken. Quite often I have been able to find specially priced pieces in bags at my grocery store. If this is the case, it is cheaper to prepare a recipe with these. If your recipe calls for a whole frying chicken, usually about 3 pounds, you can substitute with the following pieces: 8 to 10 chicken wings, 8 to 10 chicken drumsticks, 8 to 10 chicken thighs, 4 to 5 chicken legs plus thighs, 4 to 5 chicken breasts. 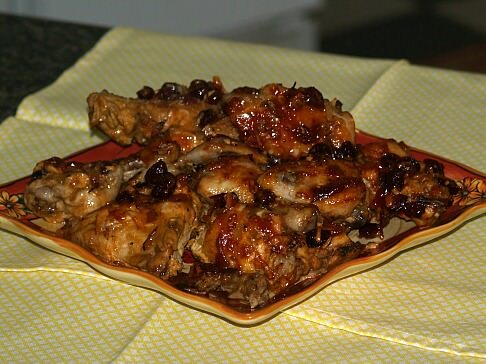 One of my favorite chicken recipes has always been a good chicken ala king recipe. This one is very simple; I like the sour cream sometimes and sometimes I add a few frozen baby peas. Melt butter in pot; add green pepper and mushrooms and cook until tender. Remove pepper and mushrooms from butter to plate; add flour and blend well. Add broth and cook until thickened; add chicken and cook until hot. Beat eggs and milk together; add egg mixture, green pepper, mushrooms and pimiento to pot. Heat for several minutes; DO NOT ALLOW TO BOIL. Serve immediately in pastry shells, on toast or over hot biscuits. NOTE: Set in hot water if cannot serve immediately. This has also become one of my favorite chicken recipes since I learn how to make chicken curry. I have always loved garlic to season and also curry powder. With the addition of ginger this is a wonderful blend of spices with the chicken and coconut. Stew whole chicken with 3 slices of onion, bay leaves, salt, pepper and enough water to cover. 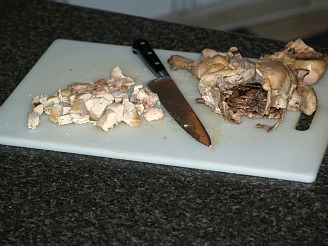 Cover and cook until chicken falls from bones; cut in 2 inch pieces. Make coconut cream by pouring 1 cup scalded milk over grated coconut. Pour another cup of scalded over coconut; set in warm place 1 hour; squeeze out coconut cream. Pour cup 3 of milk over coconut; set in warm place 1 hour; squeeze out cream until coconut is dry. DISCARD COCONUT reserving all 3 cups of coconut cream. Fry remaining onion and garlic in olive oil until brown; add flour, curry powder, ginger and sugar. Cook onion mixture slowly for 5 minutes. Add 1 remaining cup of whole milk, the second and third “squeeze” of coconut milk. Cool mixture in top of double boiler for 45 minutes; add chicken cooking and stirring for 15 minutes. Just before serving add salt if needed and “first squeeze” of coconut cream. Serve over rice with chutney, pickled pineapple, chopped peanuts, grated coconut, chopped green onion, hard cooked chopped eggs and chopped crisp bacon. Cook chicken until tender in about 1 quart water; remove chicken from broth. Cook noodles in broth until tender; cut chicken in pieces and put in with noodles. Sauté onion and bell pepper in hot melted butter until tender; add to chicken noodle mixture. Add pimientos and soup to noodle mixture and blend in. To serve heat to near boiling; remove from heat and toss cheese in lightly to blend. Cook chicken in water until tender and done; reserve 4 cups chicken broth. Cut cooked chicken into large pieces; cook spaghetti until tender and drain. Combine cooked spaghetti and chicken pieces with chicken broth. Add tomato juice, mushrooms, ground almonds and onion. Combine flour with a little water; blend flour mixture into chicken spaghetti mixture. Combine and mix dressing, cranberry sauce and onion soup mix in large bowl. 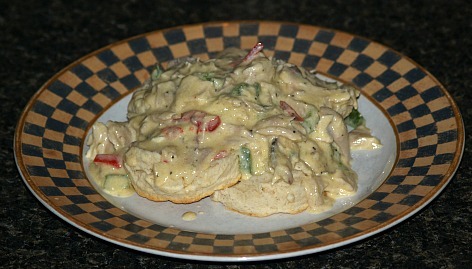 Toss chicken pieces in mixture; place in a greased baking dish. Pour remaining sauce over the chicken; bake uncovered for 2 hours. Combine milk and eggs; dip pieces of chicken and then coat with the flour. Brown chicken pieces on both sides in hot oil in the Dutch oven. Top chicken pieces with garlic, salt, pepper and tomatoes. Cover and bake 60 to 90 minutes.